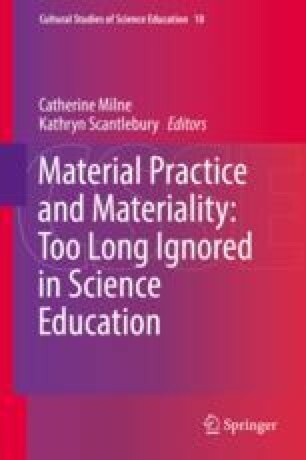 In this chapter we are interested in problematizing the notion of material and materiality and what this may mean for teaching in science. We are interested in doing this because science frequently uses and produces explanations that are different from common observations. In science education a variety of materials are used for different purposes, starting from the mundane objects such as tables and chalkboards to more specific materials, including those that bridge understanding, simulate unobservable phenomena and/or reproduce natural processes (at times by reducing the variables that are involved in their natural occurrence). The challenge in thinking with materials or artefacts is that ‘to live, humans need to interpret the world reductively as a series of fixed objects….material denotes some stable or rock-bottom reality’ (Bennett J: Vibrant matter: a political ecology of things. Duke University Press, Durham, 2009 p. 58, emphasis by original author). What Bennett refers to is the concreteness that materials and artefacts carry which ground thinking, talking or experiencing the world. We acknowledge the contributions of the project teachers and their students and the funding through the Teaching and Learning Research Initiative managed by the New Zealand Council for Educational Research.